There was a time back in 2005 when the real estate industry despite buoyant sales at the time, monetarily feared that their future was in jeopardy as Trade Me started to offer private sellers the opportunity to marketing their homes for sale in a way that could reach as wide an audience as the mainstream print media could do for licensed agents. Further, home owners found that Trade Me could facilitate online auctions which generated genuine bidders and completed sales. At that time the selection of properties for sale on the site was purely limited to private sellers; as real estate companies saw no interest in what they saw as a “bargain hunting style site” in their view, hardly a credible place to advertise a property for sale by a professional agent. Trade Me over the next 12 months made a strategic decision that was to lead to their future success and has contributed to the hugely successful listed company that it is today with a market cap fast approaching $2 billion. That decision was to withdraw from its role of endeavouring to reinvent the real estate industry through facilitated private-sale online auctions and instead focus on attracting real estate companies to advertise their listings on the site. A decision that in today’s market generates around $20m a year representing a large part of the $100m or so of marketing spent by the real estate industry each year. What is interesting is that the decision did not in any way hamper the site from becoming the most important marketing platform for all property whether for rent or to sell, for private sellers or licensed real estate agents. And whilst the cost of advertising a single property for sale may have risen from $0 for a private seller back then to close to $400 today there is no doubt that the value for private sellers in having this ‘level playing field’ is immeasurable. 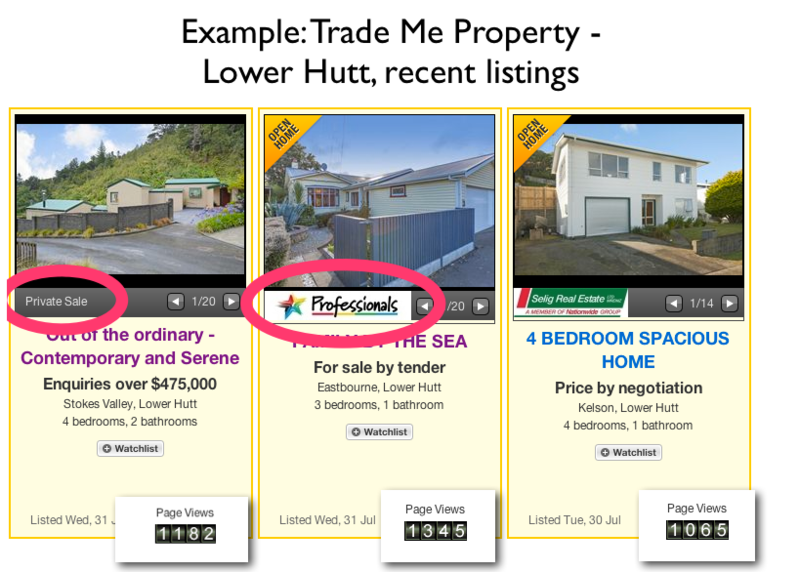 To advertise a property whether it be a private listings or an agent listing achieves the same level of interest on Trade Me as the detail below shows. The 'level playing field' for the marketing of property online has been established, especially as Trade Me dominates the viewing audience with somewhere around 1.8 million unique visitors a month to property online vs. around 450,000 for Realestate.co.nz. However as I have often stated, to sell privately is not simply about marketing your property online. The sale only occurs when the buyers have been corralled to front up with an offer, and this is where the professional real estate agent trumps private sellers as their experience and skills matched to their ‘thick skinned’ tenacity drives them to bring buyers to the table to sign an agreement. However that marginal, yet significant point of difference, in my view is being undermined by the very tool agents seem to be in love with these days – the auction. Auctions are the preferred method of sale by agents, they have really taken off in the past couple of years amounting to over 40% of Auckland sales and ever and ever shorter auction periods which in my view they are simply getting out of control. Ironically it could be this ‘lemming like’ magnetic attraction to auctions that could ‘level the playing field’ of the selling process to match the ‘levelled playing field' of marketing property created by Trade Me. Examine for a moment the components of an auction process run by a licensed real estate agent and contrast it with that undertaken by a private seller – because private sellers are turning to auctioning their homes. The 10 steps of the process to sell a property at auction. Nowhere in that list of 10 steps is there any difference what-so-ever between what an agent would do and what a private seller would do. There is no extensive facilitation or skilled negotiation, there is no time spent chauffeuring people around open homes or acting as a courier of sale and purchase agreements. Auctions have been proven by the real estate industry to be an efficient process to sell a house. Auctions though are not the exclusive domain of real estate professionals. 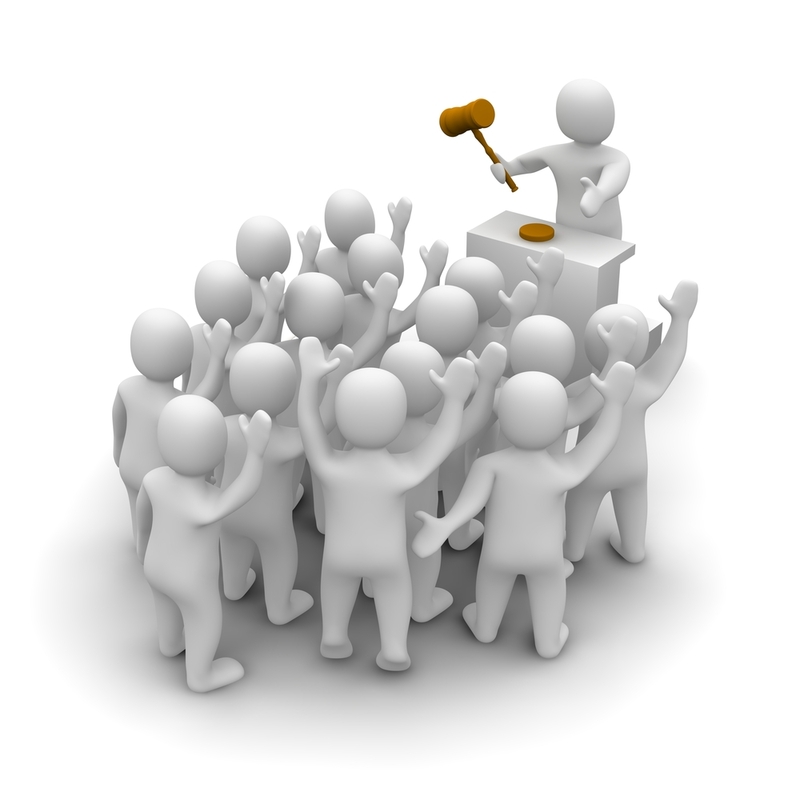 Auctioneers are a separately regulated profession governed under the 1928 Auctioneer Act. They oversee many forms of auctions from car auctions to art auctions to industrial materials auctions – all are professionally licensed and could turn their hand to sell a house by auction in exactly the same method as a real estate professional.